It’s been a while since the last update. We recently launched a brand new LiveChat Apps Marketplace, right inside the Agent App. It’s quite a milestone for us! Let’s see what else happened in the last few months. This time we focused on three major parts: The Tools, The Community and The Marketplace. We believe that all three are essential parts of the LiveChat for Developers Program. Hang on for a brief recap of our actions. What do we need tools for? We use them to solve problems faster and in more efficient ways. Why are so many tools out there? Well, there are many types of problems: crippling procrastination, cumbersome workflow or overloaded server node. Usually, all those boil down to the automation or optimisation problems. And software is a tool which is good at solving both types. And the right tool in good hands is what converts problems into challenges, and challenges into wins. A developer without any tool is not really efficient. A developer with a wrong tool might be… well, dangerous. Or at least upset. One of our jobs at LiveChat for Developers Team is to expose as many tools as possible. Beware! Last month we launched the Developer Console. It is a primary tool for you when developing with LiveChat. It serves as a user interface for the backend – the Developers Platform Service, which leverages the recently released OAuth2.0 authorization protocol. It allows you to easily create and manage secure apps within the LiveChat eco-system. If you still don’t have an account, get one now! All good, thanks ha… Long story short: an app can be anything that LiveChat is able to interpret. It could be an integration with a 3rd party service, a custom plugin to display additional visitor details or a chat widget theme. The primary goal of an app is to abstract certain functionality in an installable package, distributed at the Apps Marketplace. Technically speaking, every app is just a set of attributes (you can think of it as a JSON file). Those attributes define the type and meta details of the app. Every app instance is associated with dedicated authorization entities. If you want to know more, DM me at @filipjaskolski. LiveChat consists of two major parts: the Chat Widget and the Agent App. So far you could interfere with the first one with the JS API and custom CSS. There are also ready-to-use mobile widgets for both iOS and Android apps. What if I tell you that you can build your very own widget and still use all the goods from LiveChat? Here you have an awesome piece from @Konrad and @Mateusz, who put a great effort into publishing the LiveChat Visitor SDK. It allows you to perform a chat via LiveChat as a visitor. See how you can create your own live chat widget. 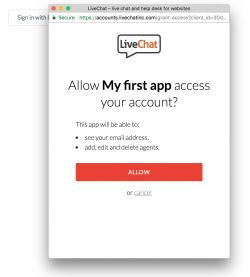 LiveChat requires the developers to use the secure OAuth 2.0 protocol for authentication and authorization of their services. We know it may be somehow intimidating, we really do! That’s why there is a new, shiny, ready-to-use “Sign in with LiveChat” button for you. Check out how can you get yourself up and running with Login with LiveChat SDK in minutes. If you want to dig deeper, go for Authorization Guide. There is nothing more satisfying than a 200 response from a well-designed REST API. Or is there? Anyway, our endpoints are waiting for your requests. If it doesn’t sound right for you, probably the REST API docs will. The same goes for webhooks: call me old-fashioned, but it is a truly robust and powerful way of interacting with any product. See how to build a webhook integration now! All this is for you. We mean it! We work hard to deliver the tools and resources, but it wouldn’t make sense without the community around it. At LiveChat we try to give back as much as we can by contributing to open source projects, sharing the data and spreading the knowledge. Thanks to the tremendous work from @Ewa, we have a steady income of new and interesting content for you to digest. Check out the new Charts section, where we share some tasty data. Be sure to seek for the Updates, Blog posts and sign up for the recent Knowledge Journey on advanced customization of LiveChat. Subscribe to the newsletter so you never miss a fresh piece! 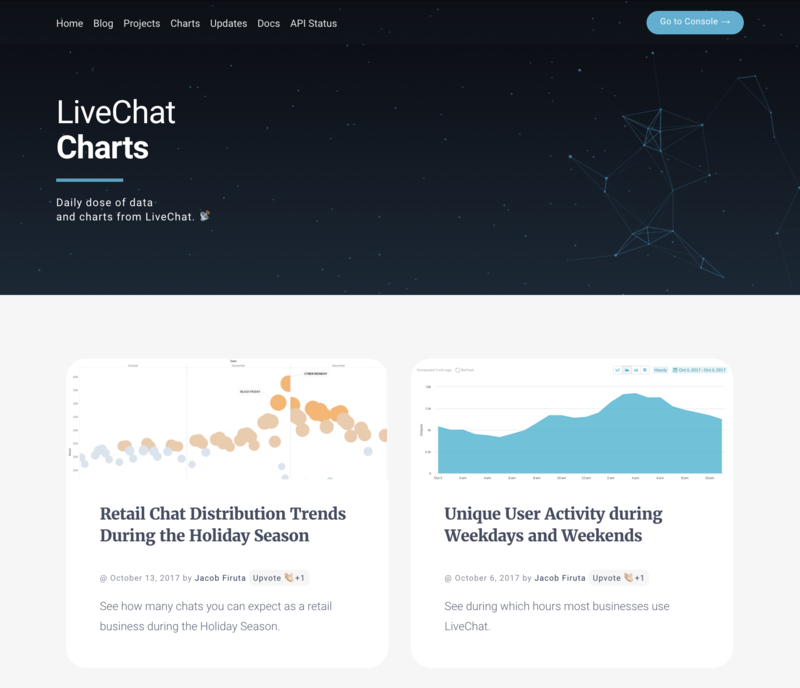 Daily dose of data and charts from LiveChat. Octopus is a server-less, easy-to-setup internal wiki page with built-in software diagrams support. It uses Markdown for writing content and enhances it with Graphviz and flowchart.js diagrams for easy software documentation. It’s an open source project from our CTO, @Bartek – show him some support! If you haven’t already, check out the LiveChat Experts Marketplace. 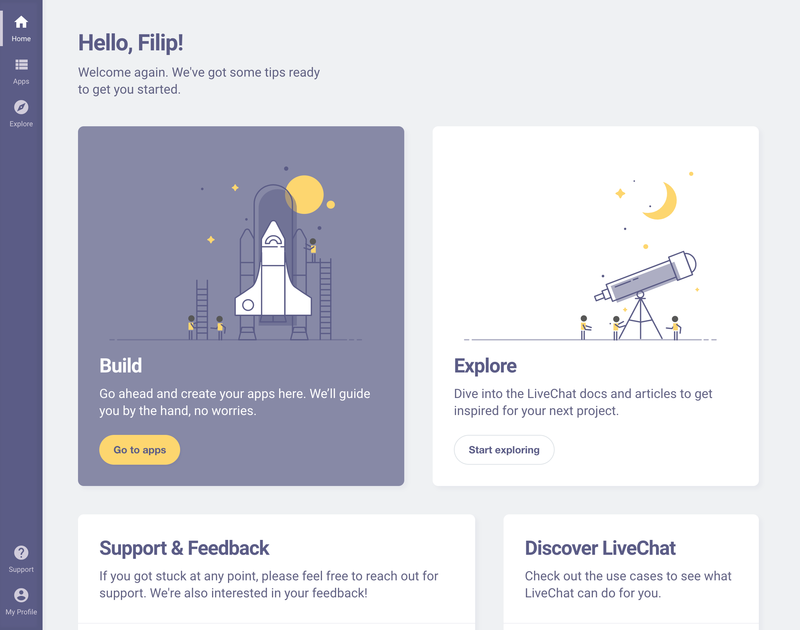 If you’re familiar with our APIs, SDKs and have resources to create tailored implementations of LiveChat, it’s a place for you. See how to apply for an Expert role. The Marketplace we’ve all been waiting for! Well, at least I have. But really, it’s great news for us all. 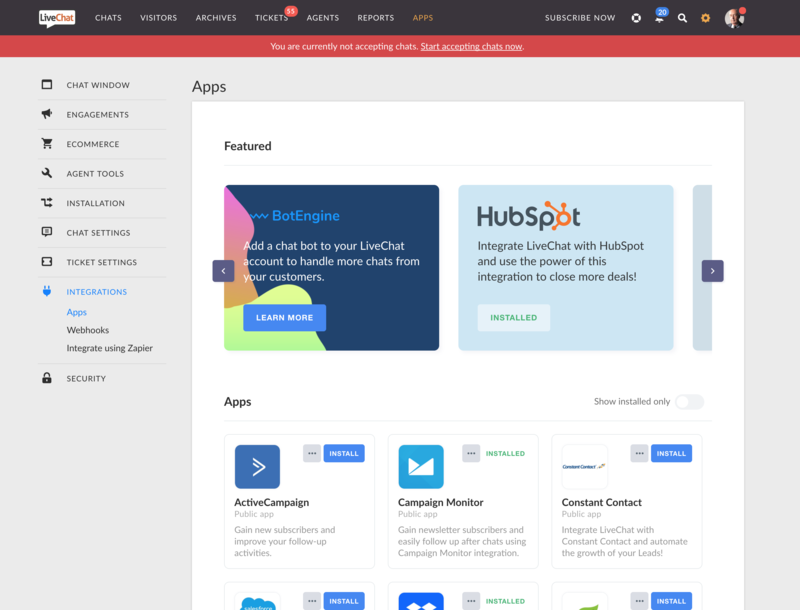 Browsing, installing and managing apps and integrations should be easy and straightforward. That’s why we brought all those functionalities right into the agent app. Starting today, all Admins and Owners can install integrations without leaving the Agent App. Soon all agents will be able to browse the extensions! It means tens of thousands of potential users of your app. There is no fun in shopping when the shop is empty. But LiveChat Marketplace constantly grows! Recently several awesome integrations joined the party. 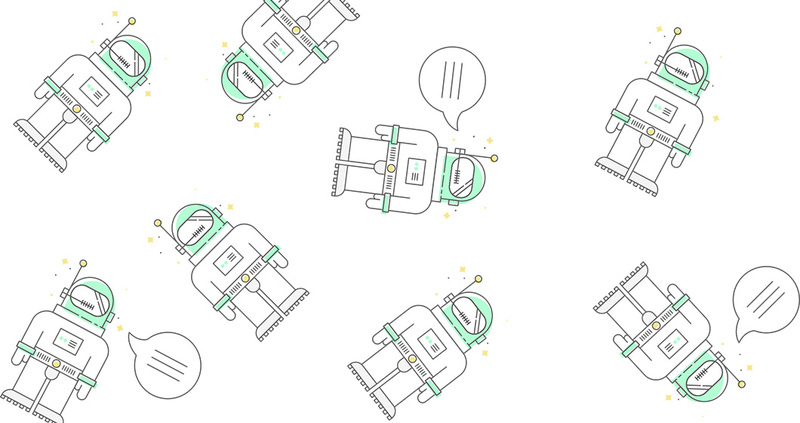 Check out BotEngine integration and get yourself a bot, so you could double your support crew! There are also new integrations available: Pipedrive, osCommerce and Constant Contact. It’s all ready for you to start building. Find your niche and call it yours! If you got your app ready, submit it for review. If you have any questions related to making your app available in our marketplace, hit us via chat! We are working hard to introduce paid apps, new integration points and loads of educational content. There is also a Chat Widget UI Kit and the marketplace of widget themes coming soon. PS: If you have any questions, insights or feedback – please fire away at developers@livechatinc.com or finds us on Twitter.